NEW ORLEANS – Today, FEMA opened a disaster recovery center at East New Orleans Public Library (5641 Read Blvd., New Orleans, LA 70127) for residents seeking local and federal services who were impacted by the Feb. 7 tornado. On Saturday, President Trump declared a major disaster declaration for the State of Louisiana. This means impacted individuals in Orleans Parish are now eligible for assistance from the federal government and allows for the release of federal funds to help recover from the severe storms and EF-3 tornado in New Orleans East. The City has set a 30-day timeline to clear all debris from the impacted area. This will be completed in three curbside passes by City contractors and local, national, non-profit and faith-based organization volunteers. In addition to clean-up efforts, the City, in conjunction with the City Council, has introduced a building permit fee waiver ordinance to ease the burden on impacted individuals as they begin to rebuild their homes and businesses. Below is a list of efforts the City and its partners have undertaken since the tornado touchdown. Residents are urged to monitor www.ready.nola.gov for up-to-date information. Today, FEMA is on the ground and going door-to-door in the impacted area registering individuals for federal assistance. You may be eligible to receive direct federal assistance for temporary housing, home repairs, and for other serious disaster-related needs, such as medical and dental expenses. In order to receive federal aid, you must first register with FEMA, even if you have registered with another disaster-relief organization. You must use the name that appears on your Social Security card on your registration. You can register whether you have insurance or not. While FEMA won't duplicate insurance benefits, it may provide assistance if you were underinsured. When registering, individuals will receive a FEMA registration number. Make sure to save this number, as it will be needed when contacting FEMA. Call the registration phone number at 1-800-621-3362. The disaster recovery center is located at East New Orleans Public Library (5641 Read Blvd. New Orleans, LA 70127) and is open 9 a.m. – 5 p.m., Monday to Friday. Representatives from the City of New Orleans, the Governor’s Office of Homeland Security and Emergency Preparedness, the Federal Emergency Management Agency, U.S. Small Business Administration (SBA), volunteer groups and other agencies are at the disaster recovery centers to answer questions about disaster assistance and low-interest disaster loans for homeowners, renters and businesses. They can also help survivors apply for federal disaster assistance. Disaster survivors who are deaf, hard of hearing or have a speech disability and use a TTY may call 800-462-7585 to register. Those who use 711 or Video Relay Service, or require accommodations while visiting a center may call 800-621-3362. All disaster recovery centers are accessible and equipped with tools to accommodate disaster survivors who need disability-related communication aids. Each disaster recovery center has assistive technologies for people with disabilities. To arrange to have an ASL interpreter at the DRC when you visit, call 225-382-1739. For more information, applicants may contact the SBA’s Disaster Assistance Customer Service Center by calling 800-659-2955, emailing DisasterCustomerService@sba.gov or visiting the SBA’s website at sba.gov/disaster. Deaf and hard-of-hearing individuals may call 800-877-8339. For information call the FEMA helpline at 800-621-3362, download the FEMA mobile app, or go online to www.DisasterAssistance.gov or www.fema.gov/disaster/4277. SBP (formerly St. Bernard Project) - Provide information to avoid contractor fraud and mold remediation, receive applications for debris removal assistance. United Healthcare – provide eligibility assistance Outreach for Medicaid expansion. Airbnb – Offering urgent accommodations. All service fees are waived for those affected by the disaster and checking in between February 7, 2017 and February 19, 2017. Visit https://www.airbnb.com/disaster/nola. As of Feb. 9, New Orleans 7th District Police Department resumed normal operation. Officers will continue a highly visible, unified, multi-agency patrol including assistance from the Louisiana National Guard and other state and local partners. At this time, there are no reported fatalities. Thirty-three injuries have been reported, 31 of which have been treated and discharged. Two patients remain in the hospital. Public safety teams completed two full search and rescue sweeps of the impacted area and inspected over 5,143 structures. The temporary shelter at Joe W. Brown Recreation Center (5601 Read Blvd, New Orleans, LA 70127) will remain open for impacted residents until Wednesday, Feb. 15. Food, water, cots and blankets are available to those who use the shelter overnight. Last night, 60 impacted individuals stayed in the shelter. Evacuteer and Second Harvest Food Bank will no longer distribute food and water at the Joe Brown Park Tennis Center. Additionally, the shelter cannot accept volunteers or donations at this time. Anyone interested in dropping off or picking up in-kind donations of food, water or other supplies are encouraged to visit Household of Faith Church or City Church. Please visit nola.gov for updates on volunteer opportunities and donation drop-off locations. The Louisiana Department of Children and Family Services’ (DCFS) is offering temporary replacement SNAP benefit for impacted individuals. Anyone needing assistance must visit a DCFS location. To find a DCFS office near you, click here . SNAP Replacement Benefits - Victims of a household misfortune who lost food purchased with SNAP benefits can apply for replacement benefits through DCFS. Note: An actual loss of food benefits would be required to be eligible for replacement benefits. To apply for replacement benefits, the SNAP household must report the destruction or loss of food verbally or in writing within 10 calendar days of the household misfortune, and then must execute the sworn affidavit (SNAP 38) within 10 calendar days of the report of the household misfortune. For the February 7 storm, the deadline to make a report and file an affidavit will be February 17. If a SNAP household reports food loss within the 10-day period but cannot travel to a DCFS office to sign the affidavit due to age, handicap, or distance from the office, a DCFS worker will mail the affidavit to the household. The head of the SNAP household must sign it and return it to the Document Processing Center. To find a DCFS office near you, click here . Power outages. If the household misfortune is a power outage, the power must have been out for a minimum of 24 hours, in keeping with federal rules. DCFS works with the Louisiana Public Service Commission to obtain reports of specific areas of power outages. Value of Replacement. The value of the replacement benefit shall be in an amount equal to the value of the lost food purchased with SNAP benefits, up to a maximum of one month’s SNAP benefits. If eligible, the replacement benefits are added to the SNAP household’s regular EBT card. Lost EBT cards – Current SNAP recipients who lost their EBT cards during the disaster must contact the EBT Call Center at 1-888-997-1117. A new card will be mailed to them at that time with instructions on how to activate the card and set the PIN. Clients cannot obtain replacement EBT cards through the local office. More information – Visit the DCFS website at http://www.dcfs.louisiana.gov/ or contact the DCFS call center at 1-888-LAHELP-U (1-888-524-3578). Service was restored to all customers whose power could be restored. More than 300 workers, including linemen, gas crew members, tree trimmers and support staff, combined forces to repair electrical and gas facilities damaged by high winds and fallen trees. A customer service team began neighborhood walkthroughs in the affected area on February 10, 2017, and will continue to distribute information in the affected areas through early next week. The team is providing customers with valuable information on Entergy’s power restoration process, the process to obtain power once residential repairs are made, as well as gas and safety tips. Customers are encouraged to go to www.entergy.com to sign up for text messages. Residents may call 1-800-9OUTAGE to report outages, downed power lines or gas odors. Until further notice ReNEW Schools Schaumburg Elementary School will remain closed. Buses ending at Walmart – Regular route. OUTBOUND: From Bullard to left on Pressburg to left on Bullard to right on I-10E to I-510 to Chef Menteur Highway exit to left on Chef Menteur Highway to regular route to Michoud/Expedition. INBOUND: From Chef Menteur Highway to right on I-510W on ramp to I-10W to Bullard exit to left on Bullard to regular route. OUTBOUND: From Bullard to left on Pressburg to left on Bullard to right on I-10E to I-510 to Chef Menteur exit to left on Chef Menteur to regular route to Michoud/Expedition. INBOUND: From Chef Menteur to right on I-510W on ramp to I-10W to Bullard exit to left on Bullard to right on Lake Forest to left on Mayo to Wilson to right on Chef Menteur to regular route. OUTBOUND: From Chef Menteur to left on Wilson to Mayo to right on Lake Forest to left on Bullard to right on I-10E to I-510 to Chef Menteur exit to left on Chef Menteur to regular route. RTA is providing shuttle service to the City’s shelter in Joe Brown Park for residents without transportation. RTA does have a Paratransit vehicle available if needed for residents requiring special transit services. For more information visit them online at www.norta.com or call our customer care Rideline at (504) 248-3900. Sewerage & Water Board (S&WB) of New Orleans is fully staffed and operational. S&WB sent 12-person crews to the impacted area each day since the tornado to assess damage and make repairs to homes and businesses. Crews have responded to requests from more than 40 residences to shut off water in order minimize damage from private water leaks. Customers with water-related issues or who are attempting to shut off water for construction purposes, are being asked to call to 52-WATER ((504) 529-2837). Entergy, City of New Orleans Parks and Parkways and the City of New Orleans Sanitation Department have focused efforts on reopening Chef Menteur Highway so residents can regain access to the main thoroughfare. 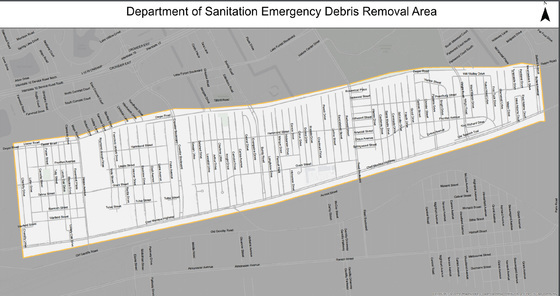 The City of New Orleans activated the emergency debris removal process. In an effort to streamline recovery, debris collection and removal of damaged trees on the public rights of way will be addressed by the Department of Sanitation's contractors in the most impacted areas, bounded by Chantilly Drive to Bullard Avenue and from Chef Menteur Highway to Dwyer Road. Only debris resulting from the recent tornado is eligible for collection by the City's contractors. All debris must be placed in front of your property in the area between the sidewalk and curb. Regular household garbage and recycling will be picked up on normal collection days. Debris piles are not to be placed on neutral grounds, next to utility poles, trees, mail boxes, electric or water meters, fire hydrants or blocking any travel lanes in the street. Debris should be separated as follows: household garbage, construction debris, vegetative debris, household hazardous waste, white goods, and electronics. Citizens do not have to cut and bundle branches in 4-feet lengths during this designated debris removal period in the impacted area. Leaves should be bagged. Collection crews will work from dawn to dusk each day, pending inclement weather. Each pass will last for four days. Residents should place all debris out by the first day of each pass. In addition to the debris contractors, crews from the Departments of the Sanitation, Parks and Parkways and Public Works will continue to remove debris and address damaged trees in the entire impacted area. Calls for debris piles and damaged trees on the public right of way, street lights, street signs and other matters outside of the area bounded by Chantilly Drive to Bullard Avenue and from Chef Menteur Highway to Dwyer Road, should be directed to 311. 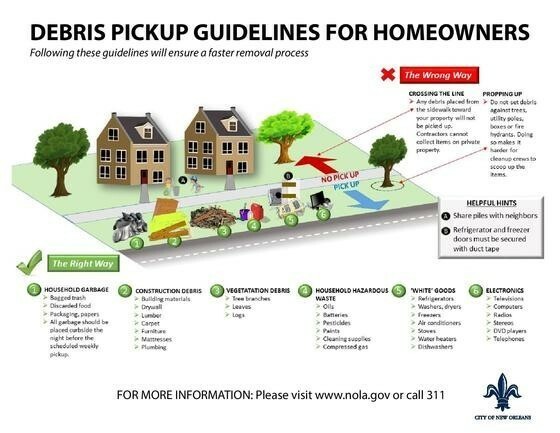 In order for debris clearing crews to work as efficiently as possible, vehicle’s found blocking debris piles from clearing trucks, will be moved to a nearby location out of the debris clearing zone by the City of New Orleans Department of Public Works. There is no fee associated with the moving of vehicles and is only done to ensure a timely clean-up. If individuals are unable to find their vehicles, please call Parking Enforcement at (504) 658-8200. The church will be receiving donations, distributing goods and dispatching teams to neighborhoods to clean up debris. Financial contributions and physical items requested for donation including bottled water, non-perishable foods, new toiletries, flashlights, batteries, baby wipes, band aids, peroxide, ointment, aspirin and basic first aid items, can be made at this location. Volunteers should arrive by 9 a.m.
Distribution Center open from 10 a.m. – 4 p.m.
HOW: Volunteers can sign up at citychurchno.com. City Church is also taking walk-up volunteers every morning at 9 a.m. Volunteers interested in assisting with community relief efforts are asked to bring tools such as crowbars, shovels, work gloves etc. Arrive in pants and work clothes. Wear closed toe shoes. Seeking volunteers to help clear debris and pack up homes of impacted New Orleans East residents. HOW: Advance sign up preferred at unitedwaysela.org/tornadorelief. Arrive in pants and work clothes. Wear closed-toe shoes. Household of Faith is seeking volunteer support with debris clean up, accepting donations/volunteers for sorting of non-perishable food items, toiletries and cleaning supplies. Clean Up Volunteers: 7:30 a.m. and 12:30 p.m. Sorting Volunteers: 9 a.m. – 3 p.m.
HOW: Volunteers can sign up at here. Household of Faith/Samaritan’s Purse is also accepting walk-up volunteers at 7:30 a.m. and 12:30 p.m. Please bring your own lunch or snacks and water. Arrive in pants and work clothes. Wear closed toe shoes. Second Harvest Food Bank is seeking volunteers for food distribution sites and in the Second Harvest Community Kitchen. SBP is conducting immediate cleanup of debris and client intake. WHEN: SBP will be accepting volunteers daily until debris clearing is complete. WHERE: New Orleans East – Exact Location TBD. Sign up using the link below to learn more. HOW: Volunteers should sign up here. Untied Saints Recovery is conducting volunteer management and debris cleanup. WHEN: Starting Monday, Feb. 13 at 7:15 a.m.
Citizens are encouraged to sign up for email and text message alerts by going to http://ready.nola.gov . This service allows city officials to contact citizens during emergencies, which includes life-threatening weather events, evacuation or shelter in place information, and other pertinent emergency information. In addition to the website, the City operates a Twitter handle: @nolaready.